Congestion is building up on the county’s main roads this morning (Tuesday, October 9). On the B2102 the road is partially blocked with slow traffic due to an accident involving a motorcycle and deer. The road is partially blocked both ways from Possingworth Lane to Lewes Road. On the A24 there is queueing traffic on Warren Road eastbound from the A27 in Crockhurst Hill (Offington Corner) to the A27 Grove Lodge Roundabout. There is also congestion on the A280 Long Furlong road eastbound before the A24 Findon Bypass. Queueing traffic is building up on the A27 Lyminster Road westbound at A284 (Crossbush Junction). 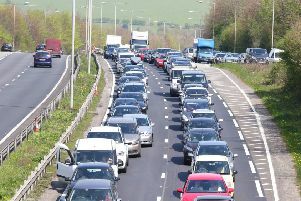 The A259 is also seeing slow traffic on Bognor Road westbound from the B2144 Drayton Lane to A27 Chichester Bypass. On the A27 there is queueing traffic on the Chichester Bypass both ways from A259 (Fishbourne Roundabout) to A285 (Portfield Roundabout). There is slow traffic on the A21 London Road southbound at A268 Hawkhurst Road.